Comet 73P/Schwassmann-Wachmann broke into at least two pieces as it passed by Earth; this image of that process was taken Feb. 13, 2017. The end may be near for a comet that has been breaking into pieces for more than 20 years. On Feb. 12, viewers using the Slooh online observatory's telescope in Chile were among the first to see the nucleus of Comet 73P/Schwassmann-Wachmann break into two pieces. This raises doubts about whether the comet can survive another trip around the sun, Slooh representatives said in a statement. The comet will make its closest approach to the sun on March 16. 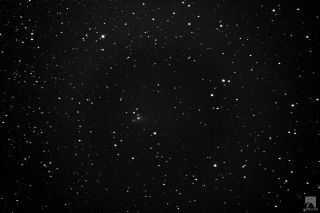 Comet 73P/Schwassmann-Wachmann and its fragment fly through the view of Slooh's high-magnification telescope in Chile. The comet was first discovered in 1930, and skywatchers saw signs of the comet breaking up in late 1995 (it broke into three pieces). Then another large event occurred in 2006, when the comet broke into more than 30 pieces as it approached the sun. Comets are loose collections of ice, rock and dust that likely originate from either the Kuiper Belt or the much farther Oort Cloud, which are zones of icy objects at the far edge of the solar system, out past Neptune. Comet 73P belongs to the "Jupiter class" of objects, which have a relatively short orbital period and come from the Kuiper Belt. The comet faces two large threats to its survival in the coming years. If it survives this latest trip around the sun, 73P is expected to fly within 31 million miles (50 million kilometers) of Jupiter in 2025. Jupiter is a known source for breaking up comets, with the most famous being the Shoemaker-Levy 9 comet that broke into several pieces in 1992 and collided with the planet in 1994. "It certainly feels like it's only a matter of time before comet 73P is destroyed, disintegrating into a trail of cosmic dust," Cox added. "One thing is certain — if the end-is-nigh for this lump of primordial space rock, Slooh members will be the first to see its demise live in Slooh's telescopes," Cox said. Members of Slooh will continue to watch the comet in the coming weeks at the organization's two remotely controlled observatories in Chile and the Canary Islands.